© Obtained by CNN Surveillance footage shows Jamal Khashoggi (left) as he enters the Saudi consulate. A senior Turkish official told CNN the man on the right, Mustafa Al-Madani, dressed up in Khashoggi's clothes after his death. A member of the 15-man team suspected in the death of Jamal Khashoggi dressed up in his clothes and was captured on surveillance cameras around Istanbul on the day the journalist was killed, a senior Turkish official has told CNN. Saudi Arabia has presented a shifting narrative of what happened to Khashoggi. After weeks of denying involvement in Khashoggi's disappearance, Saudi Arabia said that he was killed in the Istanbul consulate, saying his death was the result of a "fistfight." A Saudi source close to the royal palace later told CNN that the Washington Post journalist died in a chokehold. On Sunday, its foreign minister, Adel al-Jubeir, went further, describing Khashoggi's death on Fox News as a "murder" and a "tremendous mistake." He also said they "don't know where the body is." "We are determined to uncover every stone. We are determined to find out all the facts. And we are determined to punish those who are responsible for this murder," he said in the interview. 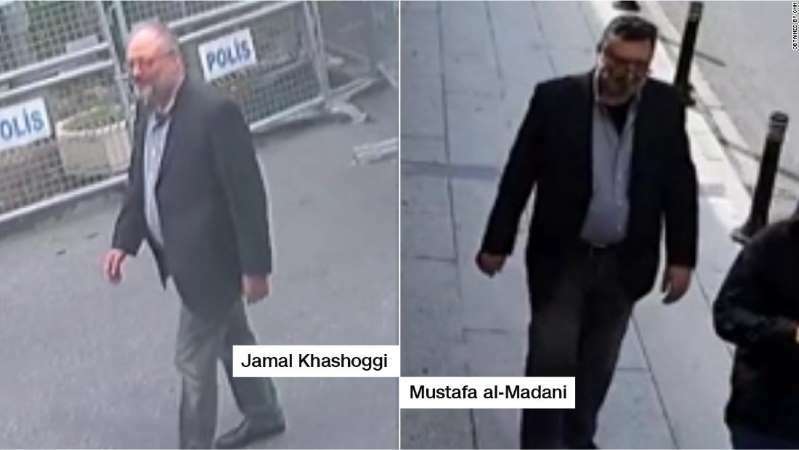 In the apparent cover-up that followed Khashoggi's death, Madani, 57, who is of similar height, age and build to Khashoggi, 59, was used as a decoy for the journalist, according to the Turkish official. A Saudi source would not confirm or deny that Madani was sent to act as a body double, though he emphasized that the killing of Khashoggi was not intentional. Madani, a decade older than the other members of the 15-man team, exited the consulate building by the back door along with an alleged accomplice. Madani was wearing what the video appears to show to be Khashoggi's dark blazer, gray shirt opened at the collar and trousers. Four hours earlier Madani had entered the consulate by the front door, alongside an alleged accomplice. Saudi's forensic medicine chief Salah al-Tubaiqi, another key suspect who was identified using facial recognition analysis together with CNN's timeline of events that day, was also present. The video appears to show Madani without a beard, wearing a blue and white checked shirt and dark blue trousers. When he exited the consulate dressed as Khashoggi, the video then appears to show him wearing the same dark pair of sneakers with white soles that he first arrived in prior to the journalist's death. "Khashoggi's clothes were probably still warm when Madani put them on," the senior Turkish official told CNN. The journalist's fiancee Hatice Cengiz, who was waiting outside the consulate's front entrance and raised the alarm when he didn't return, was told by a consulate guard that he may have exited the building through the back door, Khashoggi's friend Turan Kislakci told CNN. This surveillance footage is another piece of evidence in the mysterious case of what happened to Khashoggi after he entered the consulate almost three weeks ago. It forms part of the wider investigation by Turkish officials into the events of that day and the continued interrogation and international questioning of Saudi Arabia's version of how the journalist died. Turkish officials have been leaking a steady drip feed of details from the investigation to journalists but they have yet to release a key audio recording which sources say exists from inside the Saudi consulate. Turkey has not publicly admitted the existence of the audio.